Make your own dishwashing detergent that’s green, all-natural and non-toxic in less than five minutes at home using ingredients found at the grocery store with this easy recipe! For a year now, I’ve been on a mission to make my house as green as possible. I feel like Mr. Clean, only with way more hair (on my head that is!) and sleeker biceps. My mission first began over a year ago when I decided to start making my own shampoo from baking soda – it’s cheap, green, and very gentle on my very dry, curly hair. It has worked very well and has sparked my desire to make more of my own products to continue saving money, the planet, and my family’s health! To see all my green living recipes and posts, click here. I came across this homemade dishwasher detergent from diynatural.com in my searches and have been using it for almost nine months now. I’ve found it cleans just as well as commercial detergents, and love that it is safe for the environment and our house (many detergents omit gases into your home that can irritate those with asthma and harm ground water and aquatic life). It is also super cheap to make! The Environmental Working Group (EWG) no longer recommends Borax (source) as a green cleaning agent claiming it “can cause skin and eye irritation and may disrupt hormones and harm the male reproductive system.” I have written on this blog before on my green cleaning products post that Borax is a controversial ingredient and is easily left out. If you so choose to leave it out, simply increase the kosher salt and citric acid that you use. I really don’t know what my opinion is on this issue. There are many controversial subjects like this in natural, green living (even lavender and tea tree oil have been defamed in one study and I swear by them! ), so I have a hard time knowing what to do believe. Crunchy Betty, a green blogger I really like and respect, has the opinion that it’s safe. It’s so hard to know as a consumer, isn’t it? One year new studies show that coffee causes cancer, the next year, they’re telling us that it isn’t true and it’s healthy to have a cup a day! It makes my head spin, but I stick by the simpler and more natural, the better! How Cheap Is This Recipe? Here is a cost breakdown (if you buy the products on Amazon). The closest measurement to these ingredients is sugar, so I’m comparing sugar to use as the weight. So, this an approximate cost breakdown! Now, compared to regular dishwashing detergent like Cascade or Palmolive, there isn’t much of a difference in savings BUT this is 100% natural and eco-friendly for lakes, streams, aquatic life and much safer for your family. Remember, all those chemicals are on all over our dishes, which get ingested as we eat. My opinion is that just a little every now and then isn’t going to harm you, but every single day for years and years? Then it starts to be toxic. There are two options I have found on how to use this recipe because the Citric Acid causes the mixture to harden like a ROCK. Otherwise you will find yourself stabbing at the detergent with an ice pick and cursing all things green living! 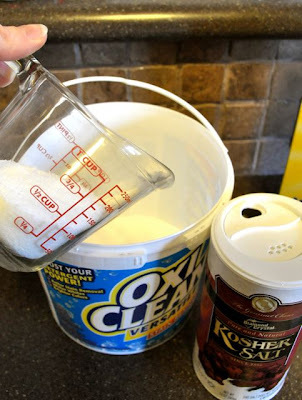 Mix the super washing soda, borax and kosher salt together and keep the citric acid separate. For each load, measure out 1 tablespoon of this mixture and put in the detergent compartment and put 1 teaspoon of Citric Acid (2 if you have hard water) in the pre-wash compartment. Mix all the dry ingredients together and add 1/2 cup of white rice (I tried brown and it didn’t work, it must be white!). The rice will absorb the moisture from the citric acid and keep it from hardening. I have not found that the rice harms my dishwasher or has any ill effects on the cleaning power of the detergent. In fact, I think it acts as a natural scrubber to get off stuck-on food! But, if adding rice seems strange to you, then go with option #1. White distilled vinegar makes for a fantastic, natural rinse aid. Just add it to the rinse compartment of your dishwasher (usually it’s on the door with a screw top). For added cleaning power and a wonderful citrus smell, use my recipe for citrus-infused vinegar! Measure out your ingredients into any container you like, and then either shake it or stir to mix. The citric acid causes the mixture to act like powdered lemonade or Koolaid – it puffs into the air and will irritate your nose and throat, so be careful if you shake it! While this is way less toxic than commercial dishwashing detergents, I would still be careful around children and keep it out of their reach due to the borax. You probably won’t have to rush off to the emergency room if ingested, but I would call my pediatrician if one of them get a mouthful! Super Washing Soda is much more expensive that straight up baking soda, and reader Maria reports that you can make your own at home. My good blogging buddy from Nature’s Nurture has an excellent tutorial on how to do just that! Enjoy a cheaper, 100% green way to clean your dishes! And, while you’re at it, check out my post on making your own green and cheap laundry detergent.